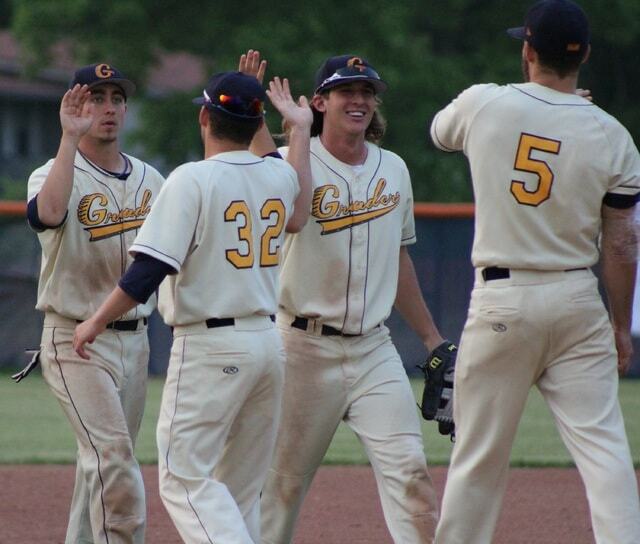 The Galion Graders were all smiles after winning the first game in franchise history on Tuesday. Galion defeated the Cincinnati Steam, 8-2. GALION — The streak is over! And that’s a good thing. The combination of outstanding pitching by Will Ore and Ben Hamilton plus a four-hit performance by Mark Delas powered the Galion Graders to an 8-2 win over the Cincinnati Steam at James D. Heddleson Field at Heise Park. The victory was the first for the newest franchise in the Great Lakes Summer Collegiate League (GLSCL). As their coach worked his stand-up routine after the game, the Graders and the crowd of 207 fans celebrated the solid win. Galion (1-4) dropped its first four games of the 2015 campaign to the two best teams in the GLSCL, Licking County and Southern Ohio. Licking County is the three-time defending league champion and Southern Ohio was the 2014 league runner-up. Ore (1-1) was dominant in his second start and first win of the season. He shut out Cincinnati during his 5-2/3 innings of work, recording six strikeouts and two walks while scattering five hits. Ore was forced to leave the game in the sixth inning after a blister on his left foot became inflamed and popped. Hamilton then entered the game and pitched 2-1/3 scoreless innings. He gave up two hits and recorded two strikeouts. Delas pounded Steam pitching, going 4-for-5 with a double and two RBI to lead Galion’s 11-hit attack. He also scored twice. Alexander Malinsky and Colton Carney also drove in two runs apiece. Malinsky perfectly executed a squeeze play in the fifth inning to drive in Delas. Brody Basilone and Brandon Wright each finished with a RBI. Wright and Jake Krupar scored two runs each. Carney and Kevin Shrock scored Galion’s other two runs. Wright, Carney, Krupar, Basilone, Hunter Clanin and Tyler Ocker each had a basehit. Andre Jernigan, Trey Ganns and Alex Corna each went 2-for-4 for the Steam (2-1). Corna drove in both Cincinnati runs with a triple in the top of the ninth inning. Wes Noble started and was saddled with the loss for Cincinnati. He gave up three runs on two hits in 3-2/3 innings. Noble walked five Graders and struck out three. Galion roughed up Trevor Simon during his two innings of work. The Graders scored five runs on seven hits against Simon. The Steam and Graders will face off again on Wednesday in Cincinnati. Galion plays at Lorain County on Thursday and then returns home Friday to entertain the Ironmen at 7:05 p.m. The Graders will play the Grand Lake Mariners this weekend. Grand Lake visits Galion at 7:05 p.m. on Saturday.